Illinois State University introduced children to string instruments in a beginner's class offered for the first time at Western Avenue Community Center in Bloomington. When the fourth grader was told she would have to turn in her cello at the end of the semester, she hugged her instrument. This was the first time Quiroz, a violinist, had worked with students who needed to be taught how to take their instruments out of the case, and how to get into proper position to play a violin or cello. Quiroz, who hopes to conduct an orchestra someday, was learning too. Quiroz was teaching Prelude, a beginners’ string class offered for the first time last spring semester at Western Avenue Community Center in Bloomington. Prelude is part of the Illinois State University String Project; previous satellite classes were held in small, rural communities that didn’t have string classes to offer elementary students. Western Avenue Community Center, a social service organization on Bloomington’s west side. The center operates as a second home to low-income and at-risk children, seniors, and members of the area’s Hispanic community. Western Avenue Director Amy Cottone was thrilled when Ransom asked if the center could host the 12-week class in its all-purpose room. The class was taught by Illinois State music education majors and was held on Saturdays so it would be more convenient for parents. The 12 spots filled up quickly with a diverse group of third and fourth graders from across the community. Tuition scholarships were available, along with instruments rented at minimal or no cost. If a student qualified for the free/reduced lunch program at school, tuition was $20. If students couldn’t afford to rent instruments, used instruments, donated to the String Project or purchased with grant funding, were loaned to them. At least half of the students learned to play with free instruments. Illinois State Assistant Professor Cara Rabe-Hemp enrolled her daughter, Lena, 9, and watched her passion unfold. Atsuko Masuyama teaches her young pupils how to play string music at the Western Avenue Community Center. Home-schooler Charlie Brehm, 9, taught himself to play guitar and piano but was attracted to the sound of the bass at Prelude. His mother, Emilie Brehm, said he loves the class, and it’s not difficult to get him to practice. “It’s the highlight of his week,” she said. The String Project began in 2001 with the support of the College of Fine Arts and a major grant from the American String Teachers Association. The project is a part of the National String Project Consortium, which includes more than 40 sites at colleges and universities across the country. Illinois State has the only String Project site in Illinois, and was named the 2013 National String Project of the Year. On-campus classes offer instruction for beginners to advanced intermediate-level string orchestra, as well as private lessons. Music majors teach the classes under faculty supervision. A team of 25 students works with 140 children every week. Prelude introduces strings to third and fourth graders. Grant money from the Illinois Prairie Community Foundation and private donors allows for reduced tuition and free instruments for families with financial need. Prelude also benefits Illinois State students who are gaining confidence as they teach. Violinist Atsuko Masuyama, a senior in music education, was working with the Western Avenue students on their bow technique, which they practiced with paper towel rolls propped on their shoulders. She has been involved with the String Project since her freshman year. Masuyama was also encouraged by the parents’ involvement. They listen to the students and help clean up after class. The semester ended with the class performing in the annual Spring String Project Concert at the University’s Center for the Performing Arts. Adriana Lizardi was the lead teacher at Western Avenue. The bilingual graduate student in music therapy arrived at Illinois State from her native Puerto Rico in August 2017. In the initial meeting with parents and prospective students, she explained the program in Spanish as well as English. 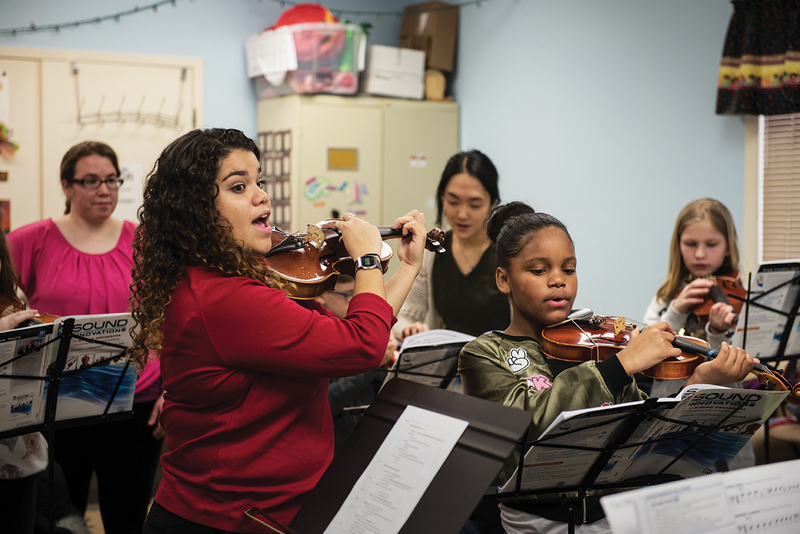 ISU student Adriana Lizardi leads a string music class at Western Avenue Community Center. Mike Jones grew up going to Western Avenue Community Center and is now on the board of directors. His home-schooled daughter, Olivia, joined the Western Avenue class. Illinois State’s School of Music offers several community programs for preschoolers through seniors. 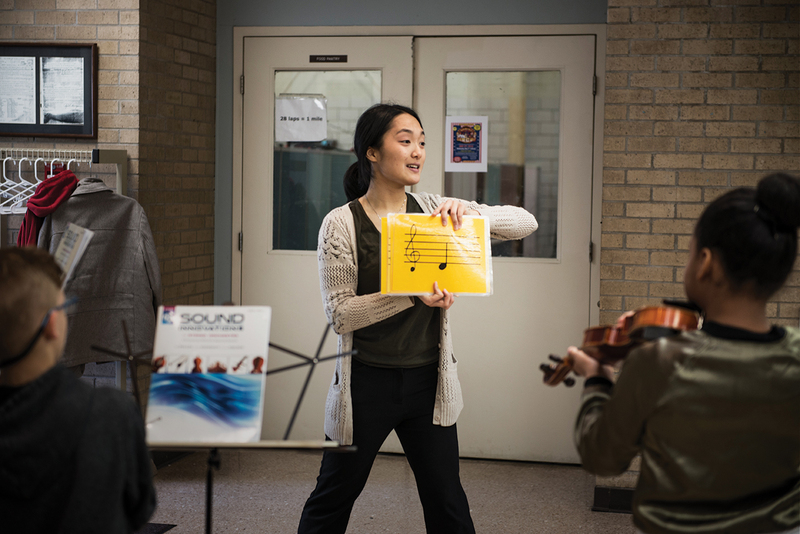 The award-winning Illinois State University String Project is an after-school music program that offers low-cost instruction on stringed instruments to children in grades three to eight. The program supports public school music programs and provides a string education to children who are home-schooled or enrolled in schools that do not offer string instruction. The project also provides teacher training for Illinois State string majors. For more information, visit FineArts.IllinoisState.edu/String-Project. The School of Music has partnered with Heartland Head Start since 2015 to provide violin instruction for preschool children through MusicScores! The free literacy-based program is designed for kindergarten readiness, using music to strengthen focus and improve listening, counting, pre-reading, motor, and social skills. Grant funding and contributions make it possible to offer the program at no cost to families. Community School for the Arts offers free Redbird Road Concerts for seniors in retirement communities, such as Westminster Village and Blair House. The concerts offer music to seniors who may not be able to travel for concerts, while also offering Illinois State music majors an opportunity to practice their performance skills. As an ISU alum, this is SO refreshing to read. Music is beneficial to mathematical and cognitive development. Great work!